Understated in design but exquisite in color and finish, this vent hood, made of 16 oz. (24 gauge) copper, features a mottled, hammered finish and a dark patina. Copper straps and buttons in the same hue add the perfect amount of detail, so as not to distract from the slate tiling along its base. This is truly a one-of-a-kind piece and beautifully combines the design elements which are sure to complement your home’s interior. 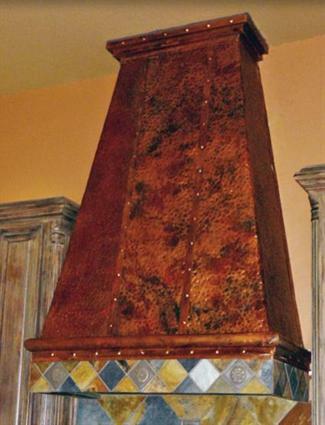 – Each copper vent hood is completely handcrafted by Master Craftsmen here in Texas, using copper mined, refined, and milled in Mexico and Chile. – Please refer to the various customization and pricing options for each vent hood. It is our pleasure to help make our specialty vent hoods a beautiful new addition to your home. – Also, please note that exact duplication of the finishes shown here is not possible due to the handcrafted nature of our products, but the general effect will be similar to what is displayed.